HOUSTON, TX--(Marketwire - February 4, 2010) - Frontera Resources Corporation (AIM: FRR) (OTCQX: FRTE), an independent oil and gas exploration and production company, today announced that it has completed a new phase of drilling operations at the Mirzaani and Mtsare Khevi Fields within its Shallow Fields Production Unit, Block 12, in the country of Georgia. undeveloped areas of the Mirzaani Field. Mirzaani #1 well and are about to commence at the Mirzaani #5 well. Khevi Field, all of which encountered expected oil and gas reservoirs. Frontera's recently completed drilling campaign at the Mirzaani Field consisted of two new wells designed to be drilled in undeveloped or underdeveloped portions of the field. The wells targeted primary reservoir Zones 12 and 13 and deeper, secondary reservoir Zones 14-18 in the Lower Pliocene age Shiraki formation. In the southeastern portion of the field, the Mirzaani #1 well finished drilling operations in late November of last year. The well was drilled to a total depth of approximately 1,500 meters, and log analysis indicated that the well penetrated approximately 146 meters of total net sandstones with average porosity values of approximately 20-25% and a rock density indicating mainly a quartz composition. These Lower Pliocene age Shiraki formation sandstones are distributed among seven known field reservoir horizons, Zones 12-18, that are situated at depths between approximately 1,200 meters and 1,490 meters. Multiple oil and gas shows were encountered while drilling. In addition to log analysis, an important 17 meter core sample was taken from Zone 12 in order to obtain detailed reservoir data that is essential for optimizing the design of well completions and quantifying reserve potential. Laboratory analysis of this first core to be taken in the field since the 1970s was conducted during the month of December. The core encountered approximately eight meters of oil saturated reservoir with average porosity values of 19%. Permeabilities were in the range of 0.2 to 20 mD, with an average value of 5 mD. The core recovery is characterized by splay sand bars deposited in the context of a complex fluvial sedimentary environment, indicating a more attractive depositional environment than previously hypothesized. The primary reservoir targets for ongoing development at the Mirzaani Field and therefore, at the Mirzaani #1 well, are Zones 12 and 13. The deeper horizons are considered a bonus if they are present. Accordingly, because multiple sands were encountered in Zones 14-18 within the bonus portion of this well, a testing program was designed to determine the prospectivity of these deeper horizons prior to testing the well's primary targets. In early December 2009, testing commenced on a seven-meter interval associated with Zone 17. High reservoir formation pressures provided an initial production rate of approximately 160 barrels of fluid per day. After testing the formation through mid-January, it was determined that this portion of Zone 17 was situated low on the Mirzaani Field structure at the oil/water contact of the southeastern portion of the field, as the produced fluids consisted of approximately 98% water and 2% oil. However, the testing results discovered significantly higher reservoir permeability than expected in this interval. Future development drilling will seek to encounter Zone 17 higher on the structure above the oil/water contact. After testing operations were completed at Zone 17, perforations were extended to commingle a ten-meter interval associated with Zone 15. This resulted in increasing the oil content of the produced fluid to 15-30% of the commingled test. A bridge plug was set in late January to move up the hole and permit isolated testing of a six-meter section of Zone 15 during the first week of February. Plans call for completion of Zone 15 testing, after which Zones 12 and 13 will also be tested. Results will then establish the basis for designing commingled frac completions for these horizons. Based on analysis to date, Frontera believes that planned frac completions of the Mirzaani #1 well's primary reservoir targets should yield a combined rate of as much as 120-160 barrels of oil per day. 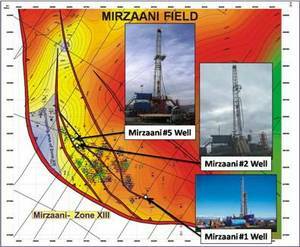 In late December 2009, the Mirzaani #5 well commenced drilling in the undeveloped northwestern portion of the field known as Mirzaani Field Northwest. It is the third well in the recently completed Mirzaani drilling campaign that was initiated by the Mirzaani #2 well's discovery of the northwest extension of the field in early 2009. The Mirzaani #5 well is located approximately 600 meters to the northwest of the Mirzaani #2 discovery well and completed drilling operations during the third week of January. It will commence production testing during the first week of February. Drilled as an appraisal well to last year's discovery, results to date from the Mirzaani #5 well have served to successfully confirm and enhance the prospectivity associated with Mirzaani Field Northwest. The well was drilled to a total depth of 1,125 meters, and log analysis indicates that the well captured approximately 120 meters of total net sandstones with a range of porosity values between 15-22%. The well encountered oil and gas bearing sands in the primary Zone 13 reservoir target at depths between 835 meters and 910 meters. In addition, multiple oil and gas bearing sands were also encountered in Zones 14-17 at depths between 910 meters and 1,120 meters. In the northwestern field extension, these Lower Pliocene age Shiraki formation sandstones are situated at depths between approximately 700 meters and 1,200 meters. As a result, as with the Mirzaani #1 well, a testing program has been designed to determine the prospectivity of these deeper horizons prior to testing the well's primary targets. Testing will begin with perforation of an 18-meter interval associated with Zone 17. In addition to log analysis, a 12.5 meter core sample was taken from Zone 13 in order to obtain detailed reservoir data for this formation. Together with the Zone 12 core taken from the Mirzaani #1 well, this core provides important new data for the field's primary reservoir targets. Laboratory analysis of the core is currently underway. However, preliminary analysis shows that the core encountered seven meters of good quality, oil-saturated reservoir. The core also revealed a fluvial bar braided stream depositional environment. A meandering channel sequence can be recognized with the presence of several point bars. These observations provide the basis for a more attractive depositional environment than previously hypothesized. Plans call for completion of Zone 17 testing, after which Zones 16 and 13 will also be tested. Results will then establish the basis for designing commingled frac completions for these horizons. Based on analysis of results obtained to date, Frontera believes that planned frac completions should yield a combined rate of as much as 200-250 barrels of oil per day. A further announcement will be made upon completion of the testing program at both Mirzaani #1 and #5. Discovered in 1932, the Mirzaani Field has historically produced approximately 7 million barrels of oil, but contains many undrilled locations across the structure. The Mirzaani #1, #2 and #5 wells are the newest wells to be drilled in the field since 1972. In 2006, Frontera acquired approximately 100 kilometers of new seismic data over the field area as part of an effort to re-map and identify new potential associated with the field. Based on analysis of data to date, Frontera estimates Mirzaani Field to contain over 50 million barrels of prospective resources within the Shallow Fields Production Unit. A new independent reserve report is currently being assembled for the Mirzaani Field. At the Mtsare Khevi Field, the #29 well was commenced in late December 2009 and completed in January. It encountered the expected oil and gas reservoirs and is currently being tested to assess both oil and gas potential. This well was the fourth in a recent four-well campaign designed to add to the existing inventory of oil and gas wells in the field. Eighteen wells have now been drilled as part of the Mtsare Khevi development drilling campaign that began in August 2008. The development is designed to produce oil from Zones I and II throughout the field and gas from Zone III, all from reservoirs associated with the Akchagil formation, situated between 200 meters and 350 meters in depth. Oil production operations at the field are focused on maintaining and increasing current daily production rates. During the months of December and January, in order to mitigate natural well decline rates and enhance the low recovery characteristics of the Akchagil's oil bearing reservoirs, Frontera continued its ongoing pump optimization programs and successfully frac-stimulated two wells. Efforts to commence gas production and associated sales from the field are also advancing. Progress continues to be made towards the design and completion of new pipeline infrastructure for the transportation of as much as 100,000 cubic meters of gas per day (590 boepd) to an existing gas pipeline network within twelve kilometers of the field. Completion of the pipeline and associated facilities has been delayed due to unanticipated engineering design modifications required by the regional gas distributor. First gas sales are now expected by the end of the first quarter. The Mtsare Khevi Field is located in the western portion of Block 12 with multiple objective reservoirs situated at depths between 200 meters and 1,100 meters. The field was discovered and partially delineated with multiple exploration wells from 1989 to 1994, but never developed and produced. After completing a field study in 2007 that indicated this field potentially contains as much as 5 million barrels of recoverable oil reserves, Frontera designed a plan to bring the shallow reservoirs from the Akchagil formation into production. Additional reserve potential exists in deeper Miocene age sandstone horizons that have previously tested and flowed oil. This potential is currently under study and will become a focus of future operations to fully develop the Mtsare Khevi Field. Rigs and equipment sourced from within Georgia are being utilized to undertake the currently ongoing development program. A new independent reserve report is currently being assembled for the Mtsare Khevi Field. "The successful results obtained so far from the Mirzaani #1 and #5 wells have moved us closer to realizing commencement of a significant increase in oil production from the Mirzaani Field. The quantity and quality of sands discovered in each of these wells and the evolution of our geologic model for the field have exceeded our original expectations, and we believe they confirm the presence of significant undeveloped reserves from this existing field. At the Mtsare Khevi Field, despite delays associated with the installation of infrastructure related to gas sales, we look forward to initiating gas sales by the end of the first quarter such that the field will generate meaningful near term cash flow for our company from both oil and gas production. Overall, the results achieved from our recent drilling campaign have served to reinforce our belief that the successful completion of these work programs will increase daily production from current levels of approximately 200 barrels per day to as much as approximately 1,000 barrels of oil equivalent per day from the Shallow Fields Production Unit." Frontera's Shallow Fields Production Unit is located in the central portion of Block 12 and represents what the company believes to be an extensive trend of low-cost, low-risk oil and gas reserves. Containing four discovered yet undeveloped or underdeveloped fields that have additional exploration potential, objectives are considered to be traditional, well-known reservoirs of Pliocene and Miocene age that are situated at depths from 10 meters to 1,500 meters. 1. Frontera Resources Corporation is an independent Houston, Texas, U.S.A.-based international oil and gas exploration and production company whose strategy is to identify opportunities and operate in emerging markets around the world. Frontera has operated in Georgia since 1997 where it holds a 100 percent working interest in a production sharing agreement with the government of Georgia. This gives Frontera the exclusive right to explore for, develop and produce oil and gas from a 5,060 square kilometer area in eastern Georgia known as Block 12. Frontera Resources Corporation shares are traded on the London Stock Exchange, AIM Market - Symbol: FRR and via the Over-the-Counter Market, U.S.A. - OTCQX Symbol: FRTE. For more information, please visit www.fronteraresources.com. For more information regarding Frontera's work at the Shallow Fields Production Unit, please visit: www.fronteraresources.com/Operations.php?link_id=43. 2. Information on Reserve Estimates: The prospective resources estimates contained in this announcement were determined in accordance with the petroleum resource definitions adopted by the Society of Petroleum Engineers (SPE), World Petroleum Council (WPC) and the American Association of Petroleum Geologists (AAPG) in 2000. Prospective resources are those quantities of petroleum which are estimated, on a given date, to be potentially recoverable from undiscovered accumulations. Gerard Bono, Frontera's Vice President and Chief Reservoir Engineer, who is a member of the SPE, is the qualified person who reviewed and approved the statements in this announcement and the prospective resources estimates associated with the Mirzaani Field and Mtsare Khevi Field. These estimates are being reviewed by Netherland, Sewell & Associates and will be released as soon as practicable. 3. This release may contain certain forward-looking statements, including, without limitation, expectations, beliefs, plans and objectives regarding the potential drilling schedule, well results and other matters discussed in this release, as well as reserves, future drilling, development and production. Among the important factors that could cause actual results to differ materially from those indicated by such forward-looking statements are: future exploration and development activities; availability and performance of needed equipment and personnel; the company's ability to raise capital to fund the planned exploration and development programs; seismic data; evaluation of logs, cores and other data from wells drilled; fluctuations in oil and gas prices; weather conditions; general economic conditions; the political situation in Georgia and relations with neighboring countries; and other factors listed in Frontera's financial reports, which are available at www.fronteraresources.com/Investors.php?link_id=23. There is no assurance that Frontera's expectations will be realized, and actual results may differ materially from those expressed in the forward-looking statements.